A great record, with lots and lots of twang. They really upped the ante on their country bona fides: the album opens with the jaunty "Here I Go Again," an uptempo country-rock tune that's very reminiscent of the Gram Parsons-era Flying Burrito Brothers, followed by "Fast Locomotive," with some tight, funky chicken-picking guitar straight out of the Jerry Reed playbook, while the instrumental "Katy Warren Breakdown" showcases some awesome Joe Maphis-flavored flatpicking. Guitarists Andrew Samuels and Tom Phillips display a mastery of country picking that's head and shoulders above what most of the country-rockers were doing at the time, while guest fiddler Tiny Moore adds some sweet licks of his own, around Phillips' dazzling yet concise dobro and pedal steel. More conventional rock/pop riffs come into play on the boogie-funk of "Lost Highway" and the dreary slow-dance power ballad, "Our Day." As a viable regional band, Redwing might not have been able to set aside their hippie-pop and ballroom boogie roots, but even if those songs give the album an uneven feel, it's still packed with genuine gems. It's also worth noting that all the songs on here are originals, including the humorous, Doug Sahm-ish "Lowdown Samuel," co-written by fiddler-pianist Ed Bogas. If you're looking for a swell souvenir of the San Francisco country-rock scene at it's best, here it is. 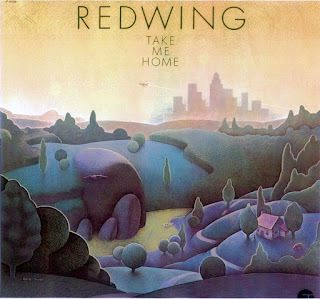 I do not know what criteria the record labes use to reissue albums on CD, but I think those Redwing releases deserve a better treatment ..